I suspect that I am of the last generation that ever considers writing anything by longhand. Indeed, there are reported to be places in America where children are no longer even taught longhand. 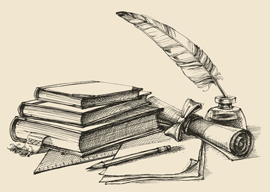 Astonishing though it now appears to me, I recall learning to write by using old-fashioned pen with a refractory nib that I dipped in a china inkwell full of watery but nevertheless deeply staining ink, filled regularly by the teacher from a metal jug that contained gallons of the stuff. How proud I was when I finished a page without making a blot (can you, I wonder, still buy blotting paper?). The smell of the ink is with me still; somehow it lingered long after school and got even into my clothes and hair, like cigarette smoke. The ink got into my skin as well, and would come out even by rubbing with pumice stone. I also remember the callus on my middle finger caused by pressure from the wooden handle of the pen. I wanted mine to be the largest in the class to prove that I had written more than anyone else. I was extremely proud of it and examined it regularly to see if it had grown, rather as I now examine the joints of my fingers to see whether the deformities caused by osteoarthritis have worsened. There is something gratifying, or at least absorbing, in watching one’s own body slowly decay. Be that as it may, the other day I had an idea for a new book that I wanted to write in longhand, and asked my wife whether she had, by any chance, a virgin notebook in which I might start to write it. She did; it was covered in sewn leatherette of an appalling, indeed revolting, color, halfway between sky blue and turquoise, the kind of color that would appeal to a young woman with a hysterical or histrionic personality. Quite apart from the empirical question of whether it is easier to write in a stream-of-consciousness fashion by longhand than by word processor—and commentary on the internet suggests quite otherwise—there is that of whether the so-called inner critic is a personage who should be kept at bay. Here I am reminded of Truman Capote’s famous (and more than justified) criticism of Jack Kerouac’s book On the Road: that it wasn’t writing, it was typing. The only explanation of the enduring popularity of this worthless book is that it appeals to the mass self-absorption that seems to have overtaken the Western world, for Kerouac was capable of traveling thousands of miles without taking the slightest interest in anything around him.